What is the difference with older Yamaha EF2000IS (v1)? 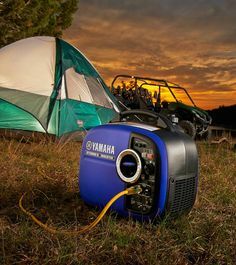 Consistently rated one of the best camping generators on the market, the Yamaha EF2000iSv2 is an inverter generator with innovative features. It’s ultra quiet, has world-class dependability and quality. The US Forest Service has approved it use at their sites for it’s quietness and safety features and it’s legal for use in all 50 states. Using its ‘smart’ engine to consume minimal fuel, it can quietly power a range of appliances and electronics, churning out up to 2000W, or 16.7 amps. It’s so quiet, you may not even hear it working! A bit expensive. At around $950 it can provide 1,600 running watts. Other generators, like the Champion 73536i inverter generator, cost almost half that and provide the same or more power (but they are junk). The EF series of generators range from 1000W generators for camping, up to the 7200W generator that a building contractor would typically use or for a home power back up system. In case you’re detecting a pattern here, you’re right – the model number contains the amount of power output in watts, after the ‘EF’. Therefore, the Yamaha EF2000SV2 in the model name stands for 2000W power. The iS indicates that this is a ‘smart’ product, relying upon a microprocessor to control the engine, making your little machine strictly fuel-efficient. The ‘i’ stands for inverter, which means it puts out the cleanest power you can get, suitable to power safely operate today’s most sensitive electronics. That means you can prop up your laptop after you plop down into a camping chair. The larger generator is EF3000 and one step smaller, the EF1000. The form of the EF2000iSV2 form looks retro-cool and the pearlescent cobalt blue shell that is the signature look of the EF series. For hunting lifestyle, The EF2000iSV2 has a camo shell. Of the entire EF series, Yamaha offers the 2000W in the hunting camouflage pattern. That shows that the 2000iSv2 is the top choice for hunters and campers. Once you’ve done your research, you’ll probably notice that a lot of website recommend this generator for its price value and technical capability. It comes with a standard 3 year warranty. You’ll have the option to add a bonus year(s) extended warranty. Get ready to factor in even more of the strong suits of the EF2000iSv2 because that is how Yamaha has placed this generator ahead of the rest. The EF2000iv2 makes it easy for you to take advantage of all of the benefits of a generator; clean, inverted power that has the best EPA lifetime value rating. Use it at the race track, camping, RVing, camping, racing, hunting, and fishing. In the event of a power outage at home, this little generator can keep the lights on. The Yamaha EF2000iv2 is full of smartly-designed features that were developed by engineers who have obviously been camping. Field testing matters to you because then you don’t have to spend time solving issues in the field while you’re camping. Some of my favorite features that make it easy to use are also somewhat self-protective features which guard the engine from wear out or user error, make it easy to maintain; for example, opening the side panel does not require screws nor screwdriver. Who wants to keep track of nuts and bolts, especially out of doors? 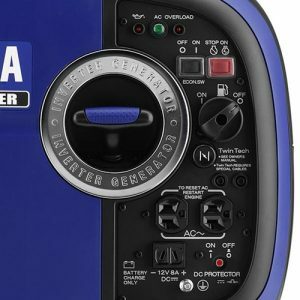 The specific features I’ll mention, in my humble opinion, make it worth the money based on the longevity they provide to the Yamaha generator owner. Never forget the bottom line – to spend time relaxing with your friends, family, and the peace of nature, rather than fixing your generator. Yamaha’s easy-to-use features make your time your own. The easy-to-read fuel gauge lets you know when it’s time to refuel. It has a 1.1 gallons fuel tank, which will last you 8-9 hours on that tank size, powering at half-speed (run speed) 1000W. Given how lightweight and quiet the EF2000iSV2, that’s a lot of power output for a small generator. The Smart Throttle decreases the engine speed (RPM) automatically when you don’t have a full load. This is the brilliant technology of an inverter generator, which dramatically cuts down on your fuel usage, therefore making it more cost-effective for you, better for the planet, and better for our health by cutting down on the CO2 exhaust. Since it can reduce it’s own engine usage, the life of the generator is increased, ensuring you have the best quality your money can buy. Yamaha EF2000iSv2’s portability also makes it easy to use. At 44 lbs. it’s very lightweight considering the 2000-watt power output this little puppy is capable of! It has an extra-large handle allowing two people to easily grab and carry together, if necessary. It is 2.2 cubic feet in. size, which is easy to store and transport. The Yamaha EF 2000iSv2 has an electrical overload breaker feature so that the generator will not power in case you hook up electrical appliances with power draw that exceeds capacity. It’s designed to protect the generator engine from user error, in a way, ensuring a prolonged engine life. It also protects you from accidentally overloading appliances with too much electricity and damaging them. Customers who review this generator have responded that the instructions are clear so that all the high-tech features are easily utilized. One of the most common complaints from people about their generators is that it can’t power enough stuff – the generator’s capacity is too low – so take the time to figure out how much power you will require. Be satisfied with your decision. What is your target number of watts? Write it all down on a notepad, asking yourself about all the electronic items you will use. Then note the power requirements of all of them, which can be found on the identification plate on the back of the appliance. Make a list of the power requirements for all the appliances you’ll be running at one time. Here’s a hint: manufacturers almost never list the start-up power needed; so figure that starting takes up to 3 times as running. Add all of your surge power numbers together and this is your maximum power draw. Yamaha’s website has calculators to help you figure this out. With any ‘smart’ device you take camping, including your phone, you can risk ruining very expensive equipment by charging them on a conventional generator due to fluctuations in power that can ‘fry’ the microprocessor beyond repair. It’s not advisable, for this reason, to hook up your devices to anything BUT an inverter generator. If you use a convention generator, you’ll be taking the power straight off the alternator, which is risky, whereas an inverter engine better controls the energy flow. In this regard, the Yamaha EF2000iSv2 has a very special feature guaranteed to safely power sensitive electronics. It’s the inverter system with Pulse Width Modulation (PWM). It refines the power coming from the the generator engine to harmonize with the appliance. PWM control produces a pure sine wave to run products with built-in microcomputers or microcomputer-controlled electric tools. The Yamaha EF2000iS max generates 2,000 watts (surge) and runs at 1,600 watts. Outlets (1) 12V DC, (2) 120V AC – up to 16.7 Amps. It’s a 79cc Yamaha engine with a recoil starter. OHV engine (overhead valve engine). The twin-tech features allows you to pair two compatible EF 2000s produce up to 30 amps. Connecting them requires accessory TwinTech II cable, or Sidewinder cable, available for purchase from Yamaha dealers nationwide, and on amazon. The auto warm-up controls engine speed at start up to help carry big loads right away. Electrical overload breaker prevents generator damage, in case of overload. You’ll greater improve the lifespan of your generator engine by performing routine maintenance (see your user manual). This is done by removing the side panels to check the spark plug, for example, and replace when necessary. You need not unscrew anything. It’s easy to maintain. The engineers at Yamaha thought through what it would take to make you successful as an owner of one of their generators; and so they designed an independent fuel petcock which allows you to conveniently drain the carburetor bowl easily for storage and transport, without tools. Easily, you can prevent stale gas problems and gummed-up carburetors. Note that this is a major differentiator between the Yamaha EF2000iSv2 and its closest competitor, the Honda EU2200i. You don’t need to check the oil to know it’s at the right level because the Yamaha EF2000iSV2 has an oil level alarm, alerting you to add more if needed, which will prevent engine damage and help you avoid costly repairs. Factory warranty covers the entire generator for defects in parts and workmanship for three years, and at the time of publishing there’s an offer for 4 year extended warranty free. Yamaha generators have the longest emission engine durability ratings issued by the Environmental Protection Agency and the California Air Resources Board (CARB). If you are at all familiar with California, it tends to regulate toxins pretty strictly. So, that CARB rating is like a badge of honor for this generator. Every Yamaha EF2000iSV2 generator engine starts out at factory spec and meets EPA guidelines. Yamaha’s 500 hour extended rating is the best on the market, which most competing products only rated at 200 hour. ‘Yes’, compared to others on the market + ‘No’ for the durability of the goods = Maybe best suited to someone who is considering a long-term purchase. It’s for a person who is looking for a quiet, modern generator that they can rely on to use minimal gas and provide refined power supply suitable for sensitive electronics. It’s guaranteed to last, so you’ll want to plan on putting it to the test. Reflect on your power supply needs while camping. Your perspective on your needs will help you evaluate whether this generator is truly expensive compared to similar generators, or at least avoid sticker shock. The MSRP (Manufacturer’s Suggested Retail Price) online the price hovers around $915. For comparison purposes, note that Yamaha EF2000iv2 can provide 1,600 running watts. Other generators, like the Champion 73536i inverter generator, cost almost half that and provide the same or more power. Every engine starts out at factory spec and meets EPA guidelines. Yamaha’s 500 hour extended rating is the best on the market, which most competing products only rated at 200 hour. A Yamaha will cost you more upon purchase, but over time, it will be retain it’s value, so you may consider it a long-term purchase. EF2000iSv2 stands for a new generation because it runs with new technology. The redesigned EF2000iS controller board is set to run the generator at maximum AC output for a longer time before overloading. The max AC output is 2000 watts.The EF2000iS (version 1) will only run for 20 seconds at max AC before the overload circuit trips, whereas the new EF2000iSv2 (version 2) will run for up to 13 minutes before the overload circuit trips. That way, you can power an AC unit at start up as well as refrigerator, both of those adding a heavy load to the generator. EF2000iSv2 can power them upon startup, and once they cool they will switch to a run cycle. This releases you from the task of monitoring the generator for trips and restarts, freeing you up to take care of other tasks. This adds a major benefit to you. In Version 2, there’s new controller with advanced programming, which improved the generators performance when operating between 1600 and 2000W. The inverter’s Pulse Width Modulation (PWM) control ‘cleans’ the electrical current, producing a pure sine wave to run products with built-in microcomputers or microcomputer-controlled electric tools. This translates to the freedom to power a gaming system, and safely recharge a laptop battery. The Yamaha EF2000iSv2 is great for anyone who needs lightweight, portable, power. If that is you, then it is definitely worth the expense, especially when you factor in the EPA rating that breaks down and proves its cost efficiency. Your return on investment is the years of life you will get off of this generator, so if you are looking for a generator your and your family can use for years to come, this is it. If you are looking for something you’ll use infrequently, perhaps this generator is not for you then. What I like about this model is that it was clearly built on smart design that was field-tested. A Yamaha will cost you more upon purchase, but over time, it will be save you money, especially factoring the 3 year factory standard warranty. The need for an inverter generator is clear, take for example benefits like reduced engine wear, and lower noise. It has a microprocessor just like the very computer, appliances, and tools you will power with it. The Yamaha EF2000iS electrical overload breaker in the generator will shut off automatically in case you hook up more electrical appliances than it is able to power. It’s a feature designed to protect your electronics from getting fried! You can pick it up at your local hardware store, wherever Yamaha is sold. Yamaha products and service is available nationwide. 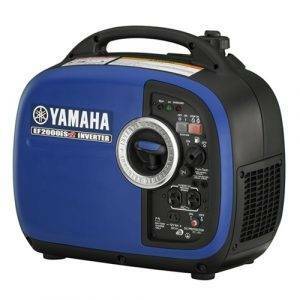 You can buy it from several retailers online, including YamahaGenerators.com. Buy it on Amazon. It’s easy to order it online and have it delivered to your home. Auto warm-up: increases speed during cold starts to handle high power demand appliances right away. At-a-glance Fuel Gauge: Allows quick fuel level inspection without turning off the unit and removing the fuel cap (what an inconvenience) like on a Honda. Inverter generator with smart throttle (The generator itself is “smart”). Super-quiet muffler with USFS-approved spark arrestor emits sound of only 51.5 dBA at 1/4 load and eliminates errant sparks. Light weight: very portable, ultra quiet, eco friendly, retro-modern style that’s sure to impress. Twin tech (parallel generator operation): can be operated in tandem to deliver up to 30 amps. Smart Throttle varies engine speed based on load. Improves fuel economy and extends englne longevity. Runs up to 10.5 hours at 1/4 load on a tank of gas. Inverter system with Pulse Width Modulation (PWM) control produces a pure sine wave to run products with built-in microcomputer-controlled electric tools. OHV engine, includes steel camshaft and valve train components. OHV engine with cast iron cylinder liner is efficient, reliable, powerful providing long life and excellent heat dissipation. Auto-decompression system: Reduces compression for easier starting. Comfortable grip handle, easy portability and storage. Electrical overload breaker – prevents generator damage in case of overload. Rubber vibration isolation feet, absorbing fee for smooth operation and noise reduction. Accessories are offered at good prices, available nationwide and on available for purchase offer the internet. Fuel petcock you can burn off the extra fuel, emptying the carburetor bowl (run the carb dry) for storage, removal of old fuel which can become gummy and possibly cause other generators, such as the Honda ES2000ai NOT to start up when needed. Electrical overload breaker, The Yamaha EF2000iS electrical overload breaker the generator will not power in case you hook up more electrical appliances than the generator is able to power. It’s a featured designed to protect the generator from user error! Oil watch warning system alarm prevents generator engine wear-out due to low oil. Avoid costly repairs and minimizing down time. Premium components throughout the 79 cc engine: cast iron cylinder liner, satellite valve face/seat, tufftride valve stems. Durability! The improvements Yamaha made upon EF2000iSv2 add value for you because of its ability to power a much wider range of applications. If there’s one thing you need from your generator, it’s to know it will start up and power everything you need. A Yamaha will cost you more upon purchase, but over time, it will ‘pay off’. We can’t predict the future, but it is safe to assume that in the future you’ll want to continue to power new generations of technology devices and take them camping with you, so it makes sense to purchase the most advanced and guaranteed to last inverter generator on the market, with pulse width modulation (PWM) technology. Even as everyday appliances become more integrated with clean energy technology and we are relying more on solar power for charging our gadgets when we’re camping, we’ll still need a back up system! 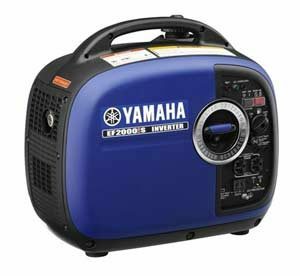 You can still rely on the Yamaha EF2000iSV2 generator. Durability is certainly Yamaha’s legacy. You should have peace of mind knowing that your generation is going to start, when you need it. Ah, The Good Old Dual Fuel Generator – Isn’t It Wonderful? Yamaha EF2000iSv2 is really awesome portable generator. 👍 it’s so powerful than it’s previous model but bit expensive. Diy-experts.net is a participant in the Amazon Services LLC Associates Program, an affiliate advertising program designed to provide a means for website owners to earn advertising fees by advertising and linking to amazon(.com, .co.uk, .ca etc) and any other website that may be affiliated with Amazon Service LLC Associates Program. 2019 Diy-Experts.net. All rights reserved.